Glancing quickly at Rafael Ochoa’s paintings, you could reasonably mistake them for a lesser-known contemporary of Vermeer or some other Dutch master from the 1700s. But look even a little closer, and there’s something unmistakably contemporary happening — they’re composed 100 per cent digitally. While depictions of rosy florists decorating a basket of quinces, a plate of assorted squashes or a woman embracing the fruits of harvest might seem like the staid fare more typical of the Dutch Golden Age or of 19th-century French academies, the 31-year-old artist’s hyper-realistic images are awash in a language distinct to the Computer Age — the geometry of his shapes a little too exact, a sense of lighting that falls and reflects with a mathematical precision, the glassy appearance of his figures’ skin. He’s chasing an aesthetic — “a certain feeling,” Ochoa calls it — of reality rendered ideally; a look you can trace from Baroque painting through to the fashion photography of our present-day glossies, he says. With one hand flipping through the middle pages of art history and the other clicking around the same software that helped breathe life into recent blockbuster films and videogames, like Teenage Mutant Ninja Turtles and Watch Dogs, the Toronto-based artist is treading ground that’s mostly unexplored in the realm of fine art. Though digital graphics jump at us from billboards, comic books, and basically everything with a screen, so few hang in our galleries, which is why it seems especially significant that, opening this weekend at Angell Gallery, the digital painter will be treated to his first solo exhibition, Overwrought. Ochoa’s aesthetic sensibility was piqued early on, when as a preschooler he’d sit transfixed by album covers from his parents’ record collection — The Bee Gees, Leo Sayer’s Endless Flight, Michael Jackson’s Thriller. “I would stare at these heavily airbrushed vinyl sleeves from the ’70s and ’80s and get lost in them,” Ochoa says. “I didn’t know that it was an aestheticized image, that they’d airbrushed them to make them more beautiful . . . I thought they were from another reality.” His interest in this particular look wasn’t just an obsession that lay dormant waiting for the right art tools; he collected it voraciously. He remembers buying a copy of the fashion magazine Surface from a book sale at his elementary school just because he liked the airbrushing. Studying photography at OCAD, Ochoa looked closely at commercial and fashion photographers such as Juergen Teller , to emulate that “certain feeling” he’d become absorbed by so long ago. When photographing models became too unwieldy, because he couldn’t control the variables of a live shoot as tightly as his practice demanded, he decided to forgo the flesh and bone subjects and proceed digitally, teaching himself 3D modeling programs. Ochoa begins an image by stitching together references from across the Internet —maybe the face of a dancer from a still shot, an arm borrowed from a family photograph, or a flower ripped from a Baroque oil painting. He blurs and sketches over the mock-up so that an entirely new image emerges. Then, he sculpts and paints a 3D model in a program called ZBrush, before photographing the virtual object in a rendering engine like Cinema 4D. After this, he exports the image to Photoshop for detailing and touchups. “I’m using these programs in a really basic, simple way,” Ochoa says, “nothing like the video game artists,” but that modesty belies the virtuosity implicit in a step like “and then I just sculpt and paint the 3D model.” The five works appearing at Angell Gallery took a combined 500 working hours to complete. And it’s his embrace of craftsmanship and technique that set him aside in today’s art scene. The name of the show, Overwrought, is a backstroke against the current of contemporary art, Ochoa says, which he finds overly fond of conceptual tricks and largely inconsiderate of the formal qualities that make art evocative at all. “There are these quick, easy ways into genius,” he says, “shortcuts to qualify something as contemporary art.” “Put a unicorn on it,” or “just paint a ladder pink,” he adds. Ochoa knows his images are grandiloquent, exceedingly romantic, and obsessed with traditional depictions of beauty — a paradox given his bleeding edge digital practice. He’s embracing that. 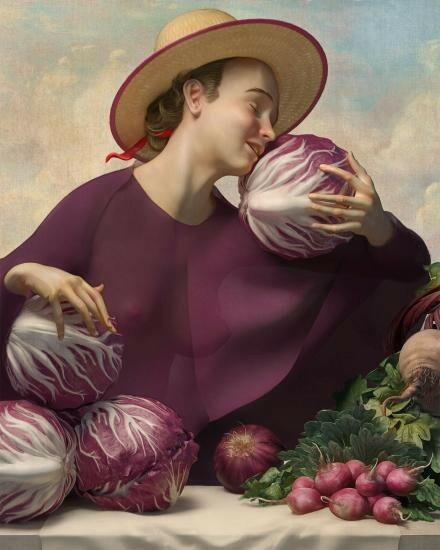 That’s the point of pieces like Romantique, a dew-dripping floral composition, and especially, Woman with Radicchio, a young woman marveling at the sensuous treasures of harvest, seemingly, in awe of the perfect. “That’s supposed to be me,” he says. The top Toronto artists to watch in 2014 work with painting, sculpture, photography, and digital imaging to give our retinas the kind of stimulation that just might keep us from spontaneously combusting or praying for an alien takeover to save us from our mind numbing daily routine. While Toronto has a thriving visual arts scene - especially for a place where rent is a billion dollars and you can't throw a tablet pen without hitting some fancy condo (smash?) - here are five artists who have caught our eye, and who will be challenging and defining the arts here in Toronto and beyond next year. Make sure you check out their shows - and follow them on Tumblr. Jimmy Limitâ€¨ Sculptor/photographer (in that order, chronologically) Jimmy Limit stimulates with bright colours and absurd forms. His photos look like commercial stock photos, until you get a bit closer and realize the objects photos like "2 Litre Mountain Dew on its side with level" are made to melt your brain. Jimmy Limit is represented by Clint Roenisch Gallery and has a solo show coming up there, but you can see him this month at Rodman Hall for Recent Advancements, curated by Marcie Bronson. Petra Collinsâ€¨ Petra Collins kept busy in 2013. Part of Tavi Gevinson's Rookie Mag team, she curated and showed in "Period Piece: The Gynolandscape" with Sonja Ahlers. Aside from her work with Rookie and Vice, her photos of Toronto band Trust appeared in Vogue Italia. Then there was that controversial (really, people?) menstruating American Apparel t-shirt. Did I mention this artist just turned 21? You can read about why Instagram deleted Collins' account for a selfie she uploaded there on The Huffington Post, and follow Collins' new Instagram here. Rafael Ochoaâ€¨ Rafael Ochoa's digital paintings mess around with classical imagery - think antique still lives and epic paintings in guilded frames rendered into The Sims universe, though obviously, especially when compared to the terrible art selection The Sims had, these read more like futuristic masterworks. Ochoa employs multiple digital-imaging software programs for each piece. The images were made for a world beyond Tumblr, and you can see them this winter when Ochoa shows at Angell Gallery in February as part of Simulators, opening Febuary 21st. Vanessa Malteseâ€¨ In Vanessa's Maltese's understated paintings and sculptures, lines, patterns, colours, and architectural elements (this describes a lot of art, but bear with me) make for rare abstracts that are compelling to spend time with - just see it for yourself. Winner of the 2012 RBC Canadian Painting competition ($25,000! ), Maltese is part of Micah Lexier's More Than Two and in 2014 she'll show twice at Cooper Cole: her solo show runs from April 10 - May 10, and her work is currently part of Endless Vacation, on until January 18. Read an interview with her here. Mitsuo Kimuraâ€¨ Mitsuo Kimura was one the stand out artists we saw at the Le Gallery stall at Art Toronto in 2013. The Japanese artist has lived in Toronto for about four years, and participated in the Sanko mural at Queen and Claremon. If you're a fan of psychedelic Toronto illustrator Alex Mackenzie, prepare to feast your eyes. Kimura's ultra detailed psychedelic paintings might just start the first rumblings of a seizure - and then you'll want more, naturally. Read an interview with Kimura in Juxtapoz here and check some work from his 2012 solo show. Then keep tabs on Le, visit Toronto's galleries as much as you can, and watch the skies. Que X-Files theme, and I'm out.